As Edison rightly pointed out “Its 1% inspiration and 99% perspiration“. This Austin K9 Signals Truck sparked the inspiration that did not stop until I had acquired this Land Rover Series 3. I am left now at the point of starting the 99% percent perspiration. This posting illustrates some of the thinking I’ve been through and inspiration about Fitted For Radio and Signals Vehicles. Its not exhaustive more of a motley collection of hap-hazard inspiration. It was the aspiration to be able to head off up a hill somewhere with the radio gear and a reasonably sized aerial set up, sit comfortably in a proper chair with a proper desk, brew a kettle, watch the sunsets and work the world via the transmitter that captivated me. As much as I pushed the idea away for a number of reasons, simply, it would not go. 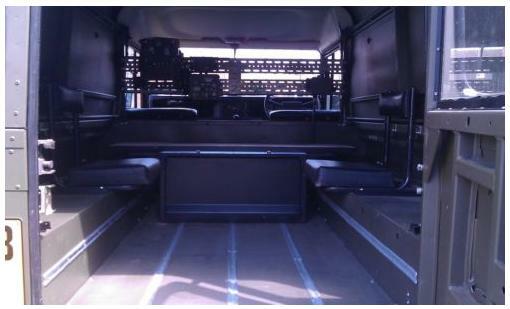 The Austin K9 signals truck – The spark of the 1 percent inspiration. Located in the Midlands I called the seller to find out more about it. The truck had been one of two purchased direct from the RAF sometime in the 60’s where both had been taken to a garage somewhere in Wales, close to the coast. The owner had wanted one for conversion into a recovery truck however before this could happen somebody made an offer for one of the trucks and it was sold. The money was used to purchase a Land Rover which was converted into a recovery truck. This K9 then sat until it was recovered around 2007 when the garage changed hands and it had to be cleared. It had suffered quite sever corrosion on the side that had faced the sea as it had sat for nearly 50 years. The engine was described as probably seized. A search on the net revealed it would be a straight six of 4 litre capacity developing some 90 horse power. Not very much by today’s standards. A chap in the boat yard had actually owned a converted K9 years ago. He promptly told me they will return around 11 miles to the gallon. Add to this it would want leaded 4 star petrol, not today’s unleaded stuff, and this as a long term ‘practical restoration’ was going to be expensive in the long term, never mind short. The only economical way to handle this was to modify the cylinder head for unleaded Petrol. Not a cheap exercise. Alternatively fitting a Diesel engine could be done, but the advice I got was that it is never, never as simple as it seems. There were further issues, expensive, that needed to be addressed in the immediate, and as much as my burning inspiration was pushed away, it would not go. This was not the vehicle for me but still the idea persisted. At the Newhaven Radio Rally this Willis Jeep made an appearance. I think but I am not sure this is no.38 wireless set. 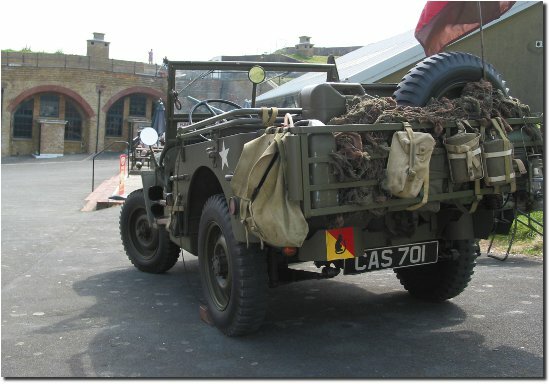 The K9 has 2 or 4 wheel drive which is missing on non military lorries. They have the ability to ‘go anywhere’. While I considered the whole thing I did take a look at motor homes or even a caravan. But these are compromises. 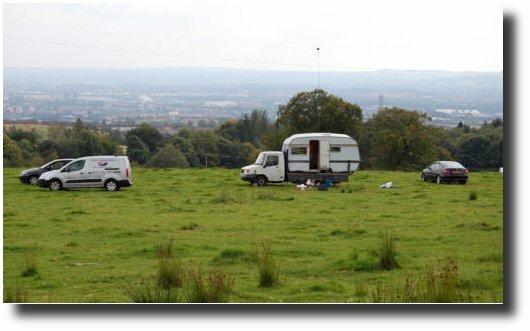 A caravan requires a towing vehicle and somewhere to be stored when not in use. Thus a caravan in itself is not an answer unless you already happen to have some way to tow it. If you have somewhere to store it, and something to tow it then quite possibly it would make an interesting static/ mobile shack instead of the the usual Garden Shed. However they will not go ‘anywhere’ other than camp sites which around here are located in the valleys between the hills. Not where I want to go, which is up the hill. 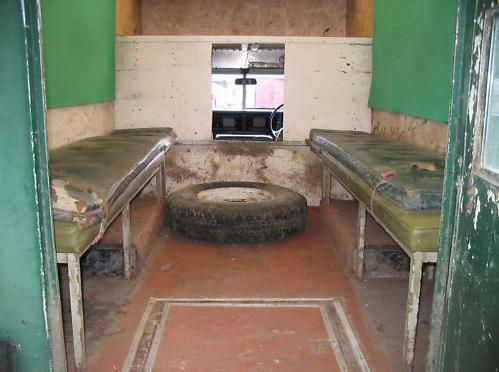 A motor home removes the need for a towing vehicle but then they are ‘van sized’ and this dictates a typical bench seat layout with collapsing table and this means ‘temporary radio set up’. Further, I felt I wanted to sit in a proper chair, not a bench seat or a car seat, facing a desk with the radio’s mounted in front of me, not with the radios to my side, so I have to look down and to the side to see what they are reading, or what control I am using. The box on the back of the K9 looks big enough to have proper desk space. A proper chair. There was even on board generating equipment in its day and the battery box is located mid length along and under the box. A picture search on Google revealed some variants were equipped with Tents that attached to the side of the vehicle and I even read somewhere there was even a penthouse tent that sat on the roof of the box. 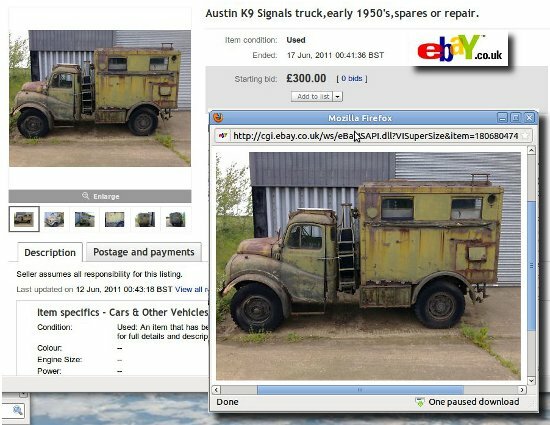 A search on Google images shows several Austin K9 signals trucks but for want of Copyright infringement I am unable to post them up here. However the tent extension provided alternative ideas to mull over. As a boat owner there is the possibility of towing my boats about. However I don’t have a trailer for this in part because I’ve never owned a vehicle capable of towing them – no point owning a trailer if you’ve no way to tow it. But having a vehicle that is capable of towing them means I am only short of a trailer to do this. Notwithstanding this, the opportunity to pick up a motorcycle I have had to borrow a van while making a dedicated Radio van makes this operation difficult if not impossible. This is food for thought. Also having a vehicle capable of towing means if I wish to venture into caravans later on, again I am half way there. Indeed a motorcycle trailer is also an option. Hallicrafters produced this war time film about their radios which are shown being introduced into a truck. If your into Ham Radio this is an interesting film. I’ve put it in reverse order, section II first, because has greater relevance to signals trucks. It seemed to me instead of a museum piece I should probably be looking at more modern 4 wheel drive vehicles which inevitably lead me into Land Rovers. The twin aerials mounted on the front wings are for VHF work. The army uses frequencies unique to the army and thus all their aerials are only suitable for Amateur frequencies after modification. 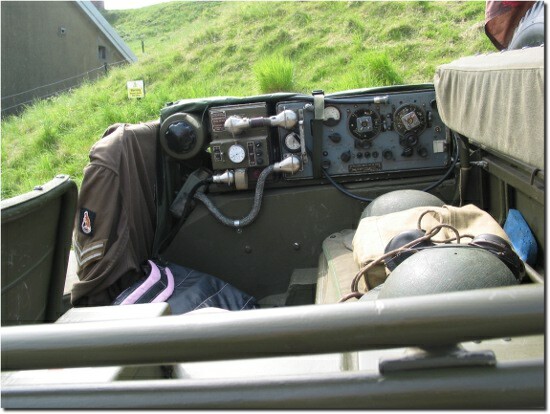 However when we take a look in the back door we find the army racks their radios across the width of the vehicle behind the driver and passenger seats, so the operators get to sit sideways on to the radio gear. 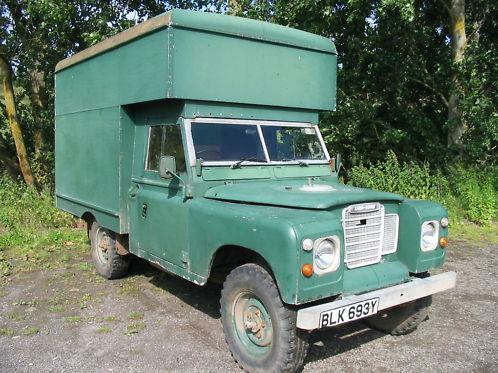 This is a really nice clean example of an FFR Land Rover and the price reflected this. It does however lack the charm of the K9. It looks modern. The seating is side on to the Dexion racking and it doesn’t have any warmth to it. Talking of warmth there is no insulation at all in the vehicle which means in the winter it will be like sitting in a fridge. I realised there isn’t a vehicle that will tick all my boxes at the right price for me so I scratched around for something that would provide a starting point. Additionally I felt that should I purchase something decent to start with, and then set about chopping it into something else, it probably wouldn’t be appreciated by the next purchaser because its no longer what it was. 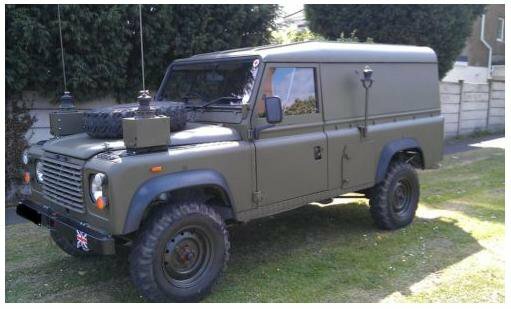 If he wanted an ex army FFR Land Rover there are plenty to choose from so why would he want a home modified one? Researching what was desirable on a Land Rover on the net the answer came back that Diesel or Petrol largely didn’t matter. Diesel maybe slightly more economical but was nosier than its Petrol counter part. What was desirable was an Overdrive and free wheeling hubs. Further all the body styles are then bolted on to that short or long wheel basis chassis so all the parts are interchangeable and mostly made out of Aluminum. This means they are also unbolt-able and provide starting point aluminum panels to begin with for modification. This vehicle shows promise as a basis for conversion but crucially, it sold for more money that I felt I could justify for it. They’re after a free replacement 12 to 14 foot caravan to replace the existing one. Can you help them? Tagged Land Rover FFR, Signals truck. Bookmark the permalink.